Second Annual Health Innovations Conference hosted by The Ugandan Academy for Health Innovation and Impact on March 19th and 20th at the Kampala Serena Hotel. 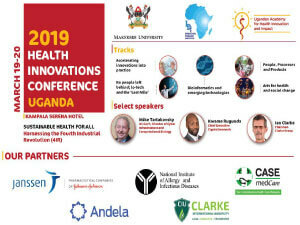 The Health Innovations Conference will create opportunities to initiate collaborative efforts in Health Innovation with representatives from the National Institute of Allergy and Infectious Diseases (NIAID), Clarke Group, CryptoSavannah, Case Hospital, Centers for Diseases Control and Prevention (CDC), United States Agency for International Development (USAID), Andela Uganda and Janssen, the Pharmaceutical Companies of Johnson and Johnson. It will be attended by members of various fields such as innovations, health, last mile health and bioinformatics. IDI together with the College of Health Science (CHS), College of Computing and Information Science (CoCIS), the US Gov’t National Institute of Allergy and Infectious Diseases (NIAID) set to launch African Centre of Excellence (ACE)program in bioinformatics. Have you ever wondered about the story of HIV in Uganda? How it might be visualized in local contexts? Or what the narratives, artefacts and archives over the time of the epidemic look like?